Mass of the Resurrection was celebrated on Thursday, August 2, 2018, at 11:00 AM at Chapel of the Holy Names, Lake Oswego, Oregon. Burial took place following the funeral at Holy Names Cemetery, Marylhurst, Oregon. 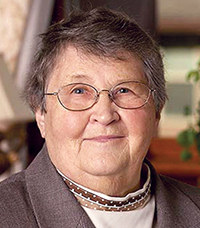 Sister Maxine Currin (Sister M. Richard James), age 95, died at the Marie-Rose Center at Mary’s Woods at Marylhurst in Lake Oswego, July 24, 2018. A member of the Sisters of the Holy Names of Jesus and Mary for 63 years, her funeral was held August 2, 2018, in the Chapel of the Holy Names. Burial followed at Holy Names Cemetery, Marylhurst.. Daughter of Lynch and Ileen Wills Currin, Maxine grew up in Cottage Grove, Oregon. After high school, she worked in a government job in support of the WWII war effort and went on to complete her BS in Business Administration at the University of Oregon. During her college years she became interested in Catholicism and was baptized in 1950. Attracted to religious life, she entered the Sisters of the Holy Names at Marylhurst in 1953 and received the name Sister M. Richard James. She taught in Holy Names high schools in Medford, Eugene and Portland. Sister Maxine’s exceptional organizational skills were recognized by the Sisters and she was sent to obtain her MBA from Notre Dame, one of the first women to graduate from the university. She then became purchasing agent and maintenance director for Sisters at Marylhurst. She took pride in her work and in 1966, she won the Cleanliness Achievement Award of the Soap and Detergent Association after submitting an essay describing floor care problems at the convent and her preventive maintenance system which included teaching a class in floor care and other maintenance problems to the young Sisters. In 1972 as needs changed at the Convent, Sister Maxine moved into the hotel industry, employed as Executive Housekeeper for many years at both Kah-Nee-Ta Resort, Warm Springs, and the Agate Beach/Newport Hilton. Most of the time she was busy with keeping the housekeeping running smoothly at the hotel, but there was another facet to her presence there. In a 1974 interview, she related that because of her religious vocation, she was frequently approached by staff and local residents for her advice and counseling about family problems, loneliness, or alcoholism. All her life she remained an avid follower of the ups and downs of the Oregon Ducks and the Portland Trailblazers. For many decades she collected scrapbooks of newspaper clippings of the exploits of the Ducks and the Blazers. Eventually she donated one set of scrapbooks to the University of Oregon Library and the other, which began from the team’s earliest beginnings, to the Blazers. When she retired, she remained in Newport, enjoying the Oregon coast and overseeing the Sisters’ beach home. In her final years, she lived in the retirement community of Mary’s Woods at Marylhurst. Sister Maxine is survived by her nieces and nephews and the members of her religious community. Remembrances may be made to Sisters of the Holy Names, P.O. Box 398, Marylhurst, OR 97036 or online at www.snjmusontario.org/donate.